Brief Les Brown Biography: Les Brown is an award winning speaker, popular author, and most importantly he is a man who can change your life for the better. His story goes that he was a twin born into poverty and adopted at only 6 weeks of age. His adopted mother, whom he calls his real mother, raised them both around the poverty level. Not only that, but Les was labeled at "educable mentally retarded" while in school. While in school, one of Les Brown's teachers had a great impact on him when he told him that the labels other people give him do not have to define who he actually is. 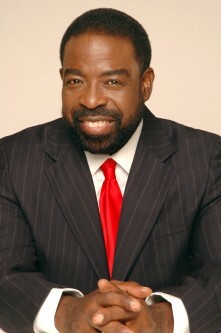 Les Brown persisted and eventually became a radio disc jockey to community leader, then onto a politician, and finally to becoming the notable speaker that we know today. 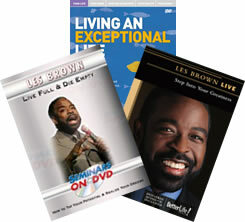 Les Brown's delivery is unique and packed full of energy and vitality. His message is uplifting and puts the power in your hands. He's into real fundamentals of success that everyone can apply successfully. Having said that, enjoy these Les Brown quotes and STAY HUNGRY! When you face your fear, most of the time you will discover that it was not really such a big threat after all. Don't let the negativity given to you by the world disempower you. Instead give to yourself that which empowers you. You must see your goals clearly and specifically before you can set out for them. Hold them in your mind until they become second nature. One of the most essential things you need to do for yourself is to choose a goal that is important to you. Get your ideas on paper and study them. Do not let them go to waste! You don't get in life what you want; you get in life what you are. I believe that life is a journey, often difficult and sometimes incredibly cruel, but we are well equipped for it if only we tap into our talents and gifts and allow them to blossom. The things you want are always possible; it is just that the way to get them is not always apparent. The only real obstacle in your path to a fulfilling life is you, and that can be a considerable obstacle because you carry the baggage of insecurities and past experience. If you view all the things that happen to you, both good and bad, as opportunities, then you operate out of a higher level of consciousness. Perfection does not exist - you can always do better and you can always grow. We all need some form of deeply rooted, powerful motivation -- it empowers us to overcome obstacles so we can live our dreams. It's important to me that money not be important to me. Some people would rather get even instead of get ahead. When you want something, you have to be willing to pay your dues. I don't recall the exact quote but I did go hear Les Brown speak when he was in Toronto many years ago. And one of the phrases he said that really influenced me over the years was that he suggested that we stay away from toxic people that are harmful to your well being. I have since incorporated this suggestion as part of my own motivational talks I give. Clint, that's a fantastic quote! I know from my brief study of Les Brown that he is big on relationships and I've heard the quote you're talking about. One of his big questions is asking yourself, who am I around? He got a lot of his lessons from Jim Rohn, and I believe this is one of them. Thank you for sharing Clint.